What do Alberta politicians and their families do over the holidays? Well lots of things – the Webber family decided to honor the memory of their wife and mother by running the Honolulu Marathon. As you may know, my more active lifestyle really began when I inherited my wife Heather’s 4 year old Labrador-Golden Retriever after her passing. I started out with half hour walks with “Lucy” when I realized that her rambunctious energy and love for getting out running told me that half hour walks were just not going to cut it. I had to graduate to slow jogs to keep up to Lucy and give her the exercise she deserves. You have to understand, I was not a runner then, in fact, I hated running and would avoid it at any cost. In time, 45 minute slow jogs evolved into 1 hour faster paced runs. Again, in time we averaged 10km an hour with goals of getting faster and going farther. When we reached about 11km per hour, I noticed Lucy was now lagging behind me and I would at times have to stop and wait for her to get caught up. I’ve been working out hard here at the gym here in Puerto Vallarta over my time off and running one hour every morning plus many reps and sets of weights. I’m feeling fitter and stronger than I have in decades, and my energy level has skyrocketed! My resolution is to continue a regimented fitness routine in the New Year. 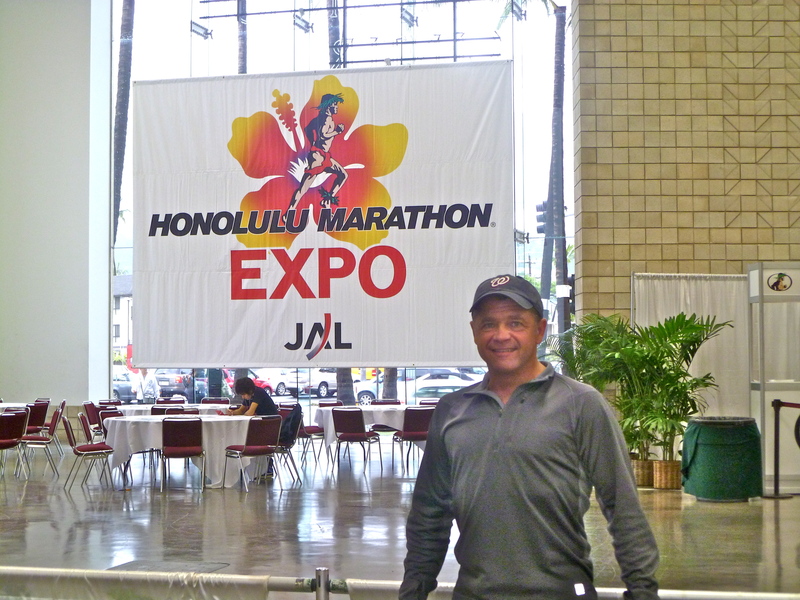 I will attempt to run the 42 km Honolulu Marathon again next December, with a goal of finishing it in less than 4 hours. Lauren Webber is just as inspiring as her father. She is the President of the Students’ Union at the University of Calgary, star student, incredible example to her peers, and never stops smiling. She is a leader, and I am confident her influence will only grow as she does. She is a face of the future for this province and I couldn’t be more proud to call her a friend. 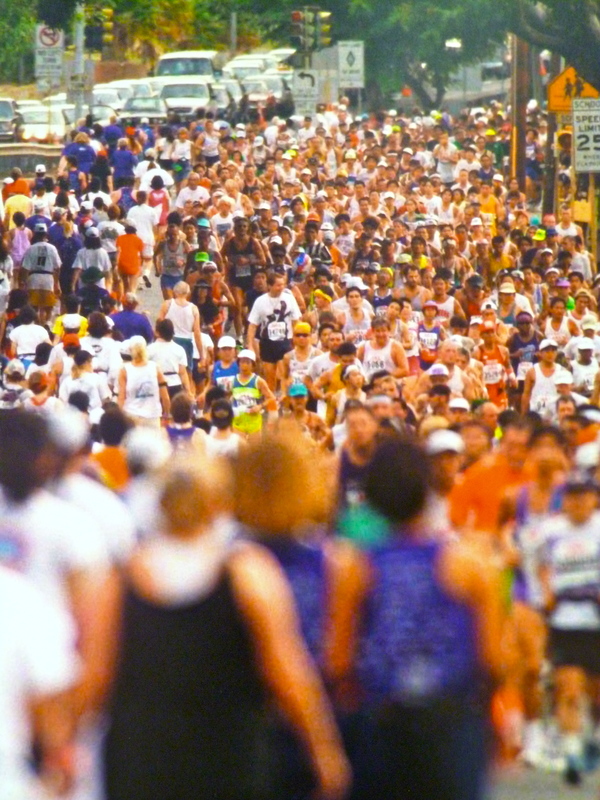 A marathon, 42.195 kilometers, 26 miles or 385 yards is a distance particular humans feel necessary to run as a road race to accomplish something in their life. My mom was one of those extraordinary humans – always someone who wanted that huge challenge. She participated as a Warrior with the Cancervive Peloton to Austin, Texas in 2007, and in 2008 found herself doing the Rocky thrust on the steps of the Philadelphia Museum, at a Livestrong event where she met cycling great and cancer survivor Lance Armstrong. Even though her cancer had reoccurred tenfold in 2010, she had always wanted to run the Honolulu Marathon and invited friends and family to train with her in December of that year. Despite her intense determination not to let cancer get the better of her, by the time the marathon rolled around she wasn’t healthy enough even walk the course. 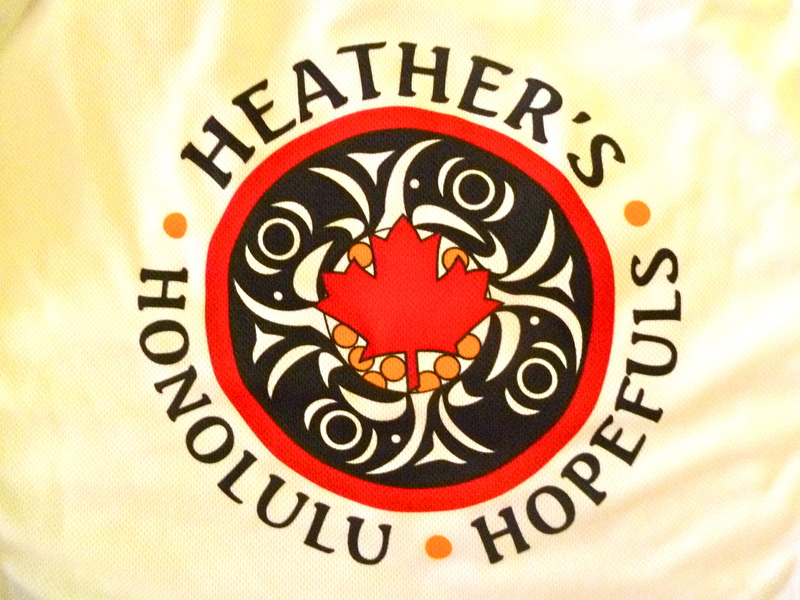 Still, she insisted on being there to cheer on the 20 friends, who called themselves “Heather’s Honolulu Hopefuls” as they crossed the finish line. My mom lived by “putting things on the books.” She always wanted me to travel, constantly be busy with fun challenges because life, especially in her case, is way too short. So, a few weeks after her funeral, that’s exactly what my dad and I did. We planned something big and planned something exciting down the road (literally). She had always wanted to finish a marathon, so my dad and I were going to finish it for her. 2010 seems like a blur to be honest. It had been an unbelievably insane year with Presidential work and traveling and family life, so training was the easiest thing to push aside. I was very nervous leading up to the run… even though I knew I had completed several of the ‘long’ training runs with some of my friends from the University team, the furthest distance had been about 2.5 hours or 30km… And I honestly thought I’d die after those.. The morning of the race Dec.12, 2010 started out great actually, the amount of people there are is probably 100 times the crowd at the Calgary Stampede parade. Fireworks marked the start of the clock and we were off at 5am. The first 10km felt great, even at the half-marathon mark, things were a little stiff – but the adrenaline, high glycogen from all the high cal ‘astronaught food’ we’d strapped to our bodies and true camaraderie between runners on the course kept us moving. Everyone tells you about the legendary, infamous ‘hitting the wall’. I didn’t think it would happen because our teammates had been so encouraging to each other and I had stayed well hydrated but I definitely hit a wall at about the 40km mark. It was about 9am now and 28 degrees Celsius, pulling teeth would have been more pleasant. Every single muscle in your body is screaming at you to stop, deep cramping kicks in, crying ensues and it takes everything in you not to begin crawling… It was the most physically excruciating feeling I have and ever will endure. Sounds fun hey? I can remember it so distinctly, even exactly where I was on the course. I felt angry with myself that perhaps if I had just trained harder, or ate healthier or didn’t have that beer at the Den a month ago, this wouldn’t be happening. I tried to distract myself from the pain, talking, drinking water, looking at the most beautiful oceanfront scenery in the world, when for some reason a documentary on Terry Fox surfaced in my mind. Terry Fox was 22 when he passed away, the same age as I am now. For 142 days straight he ran 26 miles per day. He ran a full marathon distance, every single day, crossing 3,000 miles until he was forced to stop. I have two perfectly working legs, only would run a marathon once and wasn’t being forced to stop by anything. I had only 2.19 kilometers left and my self-pity quickly withered away. It began to sprinkle rain and it was the best feeling in the world. Churchill once said, “If you are going through hell, keep going.” He was so right. At 1km left you can see the finish line just meters away. I started bawling my eyes out because I couldn’t believe I was so close and was going to finish this audacious, looming goal I had committed to 9 months prior. It was done and we got a lay of seashells around our neck by the gorgeous Hawaiian natives greeting us at the finish. I walked to a picnic table under a huge Canadian flag our team hung the day prior and we ate chips and coca-cola to get our salt and sugars restored. It was glorious. The best and most surreal feeling, I still sometimes find it hard to believe that my dad and I RAN an entire marathon. I wish my mom could’ve done it with us but I know she was there and I’m so grateful she inspired us to do something like that. It is entirely a therapeutic escape and great time all to yourself. My dad has already signed up for another Marathon; I’m so proud of him and it makes me so happy that amongst sadness, something like this has positively changed his life. Thanks so much Lauren and Len. Thank you for inspiring PCinYYC and for reminding us what life is all about. We are proud to call you friends and leaders of the PCAA. That was a wonderful story. My wife has ran many marathons, and I have a 17 yr-old Lauren of my own (Thing 1) just going into U of A Poli-Sci. Made me think about how much I appreciate them both.